Over a decade ago, managing desktop and server users was a snap. You dropped in Microsoft Active Directory® and didn’t think twice about it. Just about everything within the corporate infrastructure was Microsoft Windows-based and as a result connected seamlessly to AD. Fast forward ten years and the world is very different. The advent of Infrastructure-as-a-Service, Apple’s resurgence, and Google’s dominance with Google Apps (now known as G Suite) has completely changed an organization’s IT landscape. A modern organization’s infrastructure is made up of a variety of different device platforms including Windows, Linux, and Mac, a wide variety of web-based applications, cloud servers hosted by the likes of AWS or Google Compute Engine, and WiFi networks – along with other new IT components. The challenge for today’s IT admin is how to stitch all of those different resources together to make them look as one to a user… just as they did a decade ago. Employees and contractors would like to leverage one set of credentials to login to the network and then be able to automatically access all of their other resources. But with a variety of different platform types and locations, that goal of easy access has changed into a messy, complex situation of multiple login accounts and processes. For IT admins, it becomes even worse. They are always playing catch-up trying to figure out what devices and applications are even ‘within’ the network. The result is multiple user directories at places such as AWS, Google, Salesforce, internally, and elsewhere. Today’s IT infrastructure is complex, but managing desktop and server users should be simple and easy for IT admins – regardless of platform or location. There needs to be a central directory service within the organization that is the central point of control for users and their devices. That control should extend to groups of devices based on the user’s role and position within the company. Further, IT admins should be able to enforce security controls over the device ensuring that passwords have been rotated, are of proper length and complexity, and lockout if too many failed attempts. That level of control over managing desktop and server users is native in JumpCloud’s Directory-as-a-Service (DaaS). Windows, Linux, and Mac devices can be easily controlled for user access as well as the devices themselves with DaaS. JumpCloud also makes it easy to connect remote Infrastructure-as-a-Service solutions such as AWS and GCE back to the core, authoritative directory. Further, because JumpCloud’s Directory-as-a-Service is a SaaS-based service in the Identity-as-a-Service category, IT admins can off-load all of the heavy lifting of managing directory services. Ready for a 21st Century Directory? 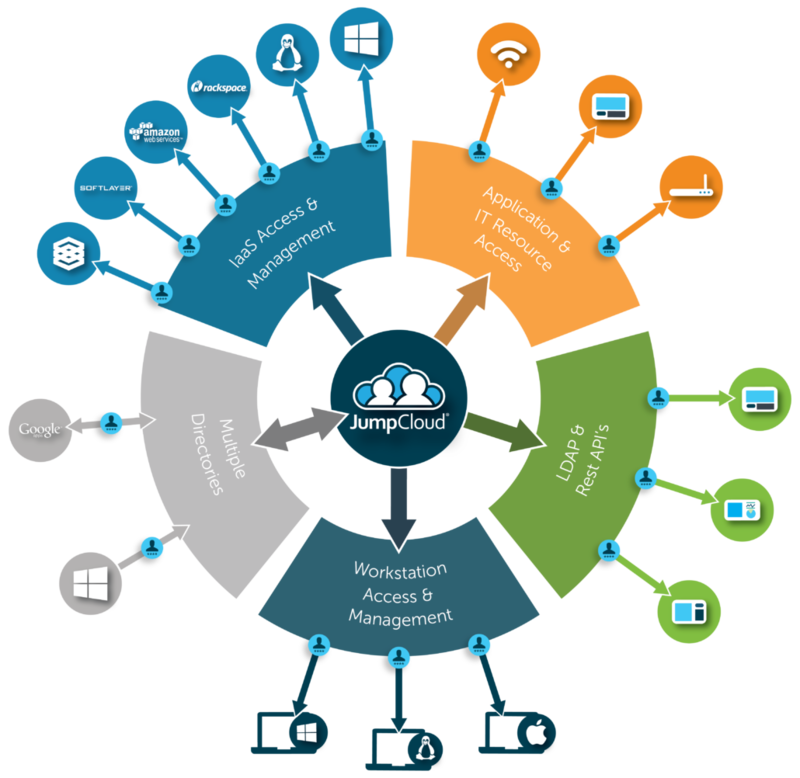 If you are struggling with centrally managing desktop and server users, take a look at JumpCloud’s Directory-as-a-Service platform. You’ll be able to easily control user access regardless of platform or location. Your first 10 users are free.